Are you really still in love with your partner, or has your relationship turned into that of an old couple? Find out with this "Are you in love" test, if your relationship is made of true love! Many couples stay together, just for the sake of it. Are you one of them? 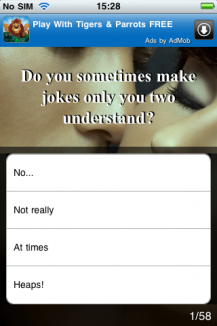 Get the correct answer to all those questions in your head with the help of this genious app! Find out, if it would be a good idea to end the relationship, or if you should still hold on to what's left of it.